The Flyers aren't the only team on an impressive win streak in the Metropolitan Division. VOORHEES — Flyers coach Dave Hakstol says it’s a little early to look at the standings and that may be for the best considering recent events. In the midst of the first nine-game win streak since 1995, the Flyers haven’t shot all the way up to the top of the league. Everyone else in the Metropolitan Division is going streaking, too. Entering Tuesday’s action the Flyers were third in the division with 39 points and had played the most games in the Eastern Conference. There’s a sizeable gap between fifth and sixth place — the Washington Capitals and the New Jersey Devils — in the Metropolitan Division. The Flyers hit their stride at the right time, otherwise they’d have been in a world of hurt. This could have been the stretch where the wheels came off and instead they’re the hottest team in the league, going for their first 10-game win streak since 1985 and couldn’t feel better about their recent success. Sometimes streaks happen because of one overriding factor for a team, whether it’s a red-hot goalie, an unstoppable power play or a player on a historic scoring streak. The Flyers have had a little bit of everything in their last nine games, all victories. When the win streak was in its infancy, Hakstol said things had been going right for a while before the victories piled up. Jake Voracek, the NHL’s No. 1 star of the week, looks back a little further. Even with injuries, the Flyers have been able to continue their winning ways. Since their first of the streak, Nov. 27 against Calgary, the Flyers have lost Matt Read to an abdominal injury and Mark Streit to an “upper-body injury” for the next two weeks. Gostisbehere missed last game with a hand injury, but is ready to return. Michael Raffl hasn’t seemed worse for wear on the top line with Voracek and Claude Giroux, but he skated with Couturier and Read before practice. The Flyers called it a “maintenance day,” but it wouldn’t be surprising if he were not able to play against the Colorado Avalanche Wednesday since he was skating with injured players. Voorhees native Cayden Primeau was named to the roster for 2017 USHL/NHL Top Prospects Game on Jan. 10. 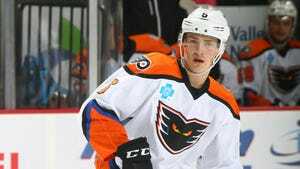 Primeau, a goalie and the son of ex-Flyers captain Keith, is eligible for the 2017 draft. … Bellmawr’s Buddy Robinson, a right-winger who plays for the Ottawa Senators, was loaned back to the Binghamton Senators after a four-game recall. He had nine hits and four shots in his latest NHL stint. … Nick Schultz is expected to remain a healthy scratch on defense for the 17th straight game.